Save money and experience the full benefits of near infrared light therapy with the Sauna Fix! This is the highest quality, most affordable, energy efficient, and therapeutic near infrared sauna on the market. The Sauna Fix lamp produces red light, near infrared light, and mid infrared light therapy. Red and near infrared light have a biological response to the body’s cells, in contrast to far infrared light, which only creates heat stress by heating up the body’s water molecules. Near infrared sauna therapy has a host of fantastic healing benefits, including: sped up detoxification, increased blood flow, relaxed nervous system, help with muscle recovery, relieved muscle stiffness, reduced joint pain, and improved circulation during every sauna session. Near infrared sauna therapy is the only way to experience the added benefit of blood shunting, which doubles the circulation effects. Blood shunting takes place when the side of the body facing the lamp heats up, and the body shunts blood towards the skin’s surface as a response to the heat. The tissues are engorged with blood and water releases from the blood stream to cool down. This produces sweat. Near infrared sauna therapy features constant side-to-side rotation that forces the body to redirect the blood shunting back and forth from each side. The rotation has the added benefit of helping to avoid any burning. Sauna faster than ever with the inclusion of the patented radiant sauna tent. No preheat is required and all healing frequencies are kept inside the sauna enclosure for optimal photo therapy! The lamp and tent are designed to work together to re-bombard the body with ideal levels of healing near infrared light. Sauna therapy is also made portable with the use of the lightweight sauna tent design. 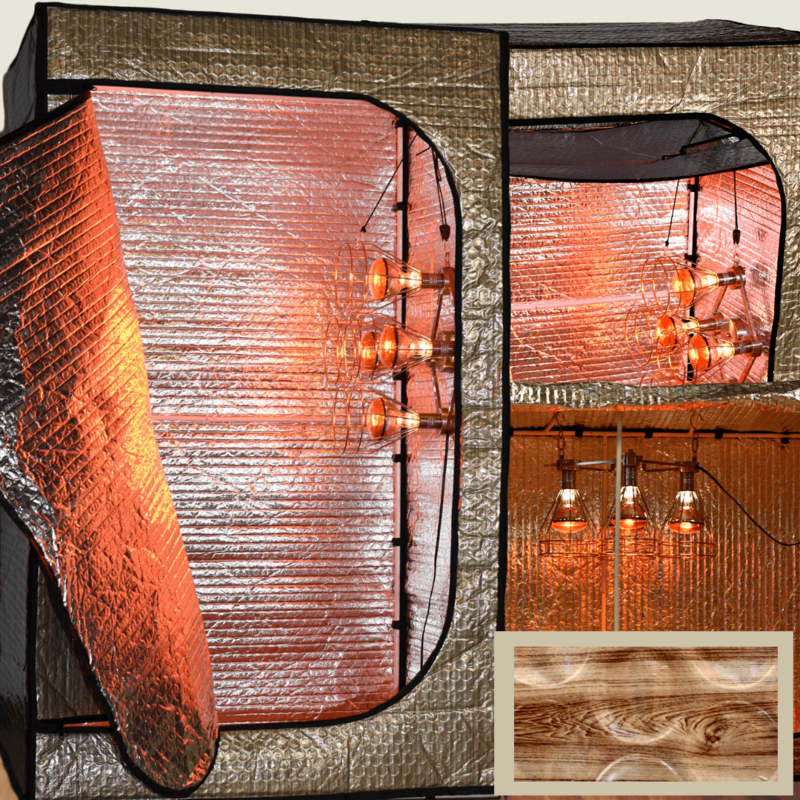 The tent panels are made from five separate layers, including nontoxic wood grain film, space blanket, large diameter bubble wrap, space blanket, and nontoxic film. Save more energy by using the Sauna Fix with the Convertible Bundle, that can be converted to sauna in three ways, or the large Hot Yoga and Exercise, which allows a user to exercise or sauna with another person. The Sauna Fix and all accessories are manufacturer UL, CE, and RoHS lab tested and certified to ensure user safety and the highest medical-grade quality. The Sauna Fix lamp and radiant sauna tents do not outgas any harmful chemicals or toxic metals during use. It is impossible for a sauna to emit zero EMF since any product connected to power generates some amount of EMF. However, we have taken all measures to guarantee customers have the safest sauna experience possible. The sauna has been extensively tested and we have proof of its safety in form of our test results. Please take a look at the testing done on the Sauna Fix to ensure it is safe to use. There is no other sauna competitor with this third party testing to prove safety. In addition, there is no aluminum found in the light fixture's sockets. Please remember bulbs do not come with the purchase of the Sauna Fix. Visit this page to learn where to purchase bulbs to work with it. The Sauna Fix NIR portable tent sauna system requires no tools, no contractor, and no hassle. Just assemble, plug in, and sauna anywhere indoors. Jump-start the effectiveness of your fitness, wellness, detox, recovery or nutritional balancing program with a Sauna Fix tent sauna system.